With the encouragement of a few local residents, the Reverend Samuel Lovejoy Gillespie delivered the first Protestant sermon in Brigham City from the front steps of the Box Elder County courthouse on April 3, 1876. This Presbyterian minister from Corinne was asked by a deputy sheriff by what authority he was there and is said to have answered, “By the authority of the Lord Jesus Christ, and exercising the rights of an American citizen.”1Wishard, Samuel E. The Mormons. New York City: Literature Dept., Presbyterian Home Missions, 1904, 52. https://archive.org/details/mormonswishardse00wishrich. Rev. Gillespie’s brave foray into what was considered a 100 percent Mormon community brought him enough support among local residents that he began a search for property upon which to establish a Presbyterian Church.2Sarah Yates, “Early Brigham had non-Mormons, too” Box Elder Journal, Brigham City, Utah, July 8, 1976, 7. This young minister was not unfamiliar with Utah, having begun serving as pastor of the Presbyterian Church in Corinne in 1874, as well as being called upon to serve as a visiting pastor in Ogden, Utah; Evanston, Wyoming; and Malad, Idaho. Rev. Gillespie’s Brigham City courthouse sermon came less than eight years after the Presbyterian Church had entered the home mission field in Corinne, soon after completion of the transcontinental railroad line. By 1869, the year of the first Presbyterian sermon in Utah, at Corinne, the number of non-Mormon people in Utah totaled approximately 1,000 of the 70,000 Utah residents in all. Perhaps one-half of these 1,000 were miners, a job that the Mormon leadership had prohibited for Mormon people. Another large Gentile group worked for the railroad.3Frederick G. Burton, Presbyterians in Zion – History of the Presbyterian Church (U.S.A.) in Utah, Vintage Press, New York, 2010, 59. The period from 1875 through 1883 experienced the greatest Presbyterian missionary efforts in Utah, but also faced increasing hostility from Mormons, who had no interest in being converted, since the majority had already converted to Mormonism from mainline Protestant churches, either in America or in their native lands. Missionaries shifted their focus to the growing population of Gentiles, as well as to dissident Mormons. Rev. Gillespie was well-equipped for the work he faced in forming a Presbyterian congregation within a Mormon town. Born in Ohio on January 12, 1838, he was named in honor of Elijah Lovejoy, editor of an abolitionist newspaper, who was killed by a pro-slavery mob on November 7, 1837. He served during the American Civil War with the 1st Ohio Cavalry of the Union Army.4Princeton Theological Seminary, Alumni Association, and Joseph H Dulles. Necrological Reports and Annual Proceedings of the Alumni Association of Princeton Theological Seminary. Volume III (1909): 604–5. Available online at http://archive.org/stream/necrologicalrepo03prin#page/564/mode/2up. Following the Civil War, Gillespie attended Princeton Theological Seminary, and was ordained to the ministry in 1871, and left for West Africa to serve as a missionary for the Presbyterian Church shortly thereafter. In Africa, he met and married another missionary, Miss Martha “Mattie” Boyd White. Upon their return to the United States in 1874, he was assigned to serve in the home mission field in Corinne, where in 1870 early adherents had built a frame church with a 75-foot spire.5Sarah Yates, History of the First Hundred-Twenty-Five Years for the Community Presbyterian Church of Brigham City, Utah, 1878-2003, Brigham City, Utah, 2003, 1. See also Princeton Theological Seminary, Alumni Association, and Joseph H Dulles. Necrological Reports and Annual Proceedings of the Alumni Association of Princeton Theological Seminary. Volume III (1909): 604–5. Available online at http://archive.org/stream/necrologicalrepo03prin#page/564/mode/2up. Corinne was not faring well by the mid-1870s, as the Utah Northern Railway had bypassed it and taken much of the lucrative freight trade to the north. That fact, coupled with the expansion of Presbyterian schools and churches throughout Utah Territory, provided impetus to expand into the larger and more prosperous city. The Presbyterian Church made its most significant impact in the lives of the people of Utah through education, but the basic work of establishing congregations began first. Although he met with considerable opposition, Rev. Gillespie purchased two lots with buildings at 71 and 77 North Main for the sum of $750 paid to John M. Bridges on October 1, 1877. Bridges was said to have been a “disaffected Mormon” forced to leave the city. He personally notified the Danite living there that he must move.6Burton, 166, quoting Salt Lake Presbytery minutes. Rev. Gillespie began holding worship services in the former hotel on the property in February, 1878, but the combination of local opposition coupled with scarlet fever and diphtheria in the family kept him from moving his family from Corinne until June 13, 1878. “That first year, especially, was one of great trial. Mrs. Gillespie was ill but was unable to get assistance in her home. A sympathizing Mormon sister finally called on her in the night and offered to do her washing, if she could get it and return it after dark. This arrangement brought temporary relief.”8Wishard, The Mormons, 51. As Mrs. Gillespie noted in her diary, “Finally, I have a friend.” As Rev. 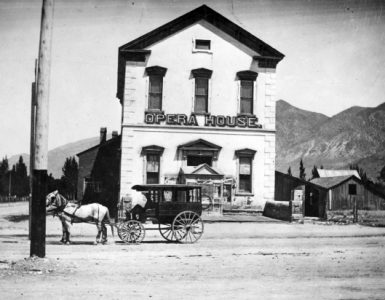 Gillespie continued his service to both the Corinne and Brigham City churches, family provisions had to be freighted over from Corinne since the Cooperative and local merchants were warned not to trade with the family. Stones were thrown at the manse and church building construction was impeded by vandalism and theft of lumber, outbuildings were overturned, and other acts expressed opposition of local residents to the family’s (and church) presence in the community. Dr. George Davies, in an article on the history of the Presbyterian Church in Utah, noted: “While the family was at prayers a stone was thrown through the window, nearly hitting one of the children.” He goes on to tell of the July 24 celebration that year, a day which included the house being stoned three times and surrounded in the evening by “a drunken mob” which kicked against the bolted door.9Yates, “History of first 125 years . . .,” 3, quoting George K. Davies, A History of the Presbyterian Church in Utah, Journal of the Presbyterian Historical Society, 1946. Nevertheless, a little community of followers did grow and help support one another, as well as the minister and his family. The collapse of the Cooperative also brought back private businesses whose owners felt free to deal with all customers, so the family was able to purchase food, clothing, and other necessities locally. A 1944 account written by a local parishioner stated that the church building was erected the summer of 1878, with Watkins and Carson as builders, and this has been accepted as history by subsequent writers. However, research for Presbyterians in Zion, published in 2010, found an 1886 article noting that the “hotel building on the property purchased from Mr. Bridge included a front room 15 x 28 feet, which was made into a schoolroom and chapel, and the Gillespie family occupied the remainder of the building.”11Burton, 166 quoting Robert G. McNiece, Utah Presbytery – Another grand Meeting at Brigham City, 232. Rev. Gillespie opened a free school in September 1878, and the following year sent for his sister, Miss E. F. Gillespie, to assist in the instruction of the children. The Board of National Missions sent qualified teachers for the school from 1891 until it closed in 1909, with an early church report listing 18 teachers as having served. Several children of local Mormon families attended the school since it had eastern educated teachers and its quality of education was considered superior to local schools.12Yates, “Early Brigham had Non-Mormons. . .,” 7. As to the structure in which worship and school were conducted, in 1884, Rev. R. G. McNiece described the building used by Rev. Gillespie as “a rickety, dingy old building that is a positive disgrace to the grand cause it represents,” partially because “this wretched old structure was . . . in such unpleasant contrast with the other attractive buildings” in the area.Burton, 167, quoting McNiece, R.G. “Presbyterian Work in Cache Valley – Concluded.” The Earnest Worker 1, no. 6 (1884): 2. McNiece goes on to say that he heard Rev. Gillespie say “That his missionary work in the heart of Africa, where he once labored four years, was attended with far less difficulty, peril, discouragement and annoyance than his work in Brigham City.”13 Available online. The Presbytery of Utah, acting in March 1885, gave priority to a recommendation by the Committee on Church Erection to provide $2,400 for a chapel and school building at Box Elder. 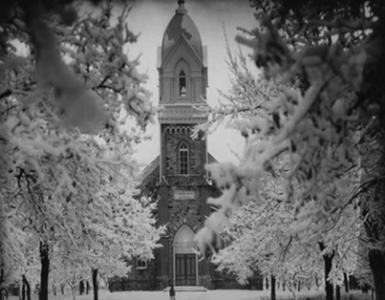 By August 1887 the chapel had been completed at a cost of $2,075, of which $1,500 came from the Women’s Executive Board and $441 from the Committee.14Burton, 167. The following year, 1888, the committee recommended that, “Rev. S. L. Gillespie have the privilege of building a manse on the south side of the church lot in Box Elder.” Since it was noted there was not an organized church there, the committee also recommended a permanent grant of $1,350 for its erection.16Burton, 167. On October 18, 1890, the Presbytery of Utah officially organized the church, which had six members. Dr. F. A. Williamson was the church’s first elder. Other early elders who faithfully served the little church include John M. Coombs, L. W. Meed, Julius Hunter, John R. Eldridge, Charles William Johnson, John Johansen, Joseph L. James, Charles K. Olson, and Joseph Langdon.17Yates, “History of first 125 . . .,” 4. By this time, Rev. Gillespie and his family were well accepted in the community. The church was sometimes used for public meetings and functions by the community, as indicated in various notices in the town’s newspapers of the period. Their family had expanded to include four daughters. Mrs. Gillespie was appointed as postmistress in 1880, an appointment from the government and not under local control. However, she proved to be an able worker at this post and helped build the favorable impression that was now accorded to the family. In 1886 a convention of over 60 ministers, missionaries, and teachers was met at the train station with a rousing welcome by the city band. In March 1892, the Committee on Visitation reported “It was encouraging and refreshing to find at Brigham City a widely extended religious interest as the result of special meetings. Four converts, who gave evidence of genuine and thorough conversion, united with the church on Sabbath March 20th, making the total membership of the church thirteen, with the prospect of other additions. Brigham City is a very difficult field, one of most difficult in our Presbytery. In holding that ground in the face of all the obstacles for nearly 15 years, Brother Gillespie has given us a suggestive example of Christian patience, faith and perseverance. Similar glowing reports were made by the committee in 1893 and 1894, including the fact that the people were redeeming their pledges to the pastor’s salary and that no debts rested on the property than the mortgage . . . In 1895 it was reported that there were 16 members and an average attendance of 27 in Sabbath School.18Burton, 168. When Reverend Gillespie left to serve in Iowa in October, 1895, the city turned out to give the family a rousing farewell as they departed on the train. At the time, Presbytery minutes stated: “he has been our missionary hero.”19Utah Presbytery Minutes, August 1895. Arriving in December 1895, the Rev. Arthur Tappan Rankin was the church’s second pastor. He was a fitting successor. As was Samuel Lovejoy Gillespie, Arthur Tappan Rankin was born into an abolitionist family and was named in honor of an abolitionist, Arthur Tappan of New York. Also a Presbyterian minister, his father, Rev. John Rankin, was a leading figure in the Underground Railroad, assisted by his wife Jean and the entire family, including Arthur. Some of the family’s dangerous adventures are detailed in the 2002 book Beyond the River: The Untold Story of the Heroes of the Underground Railroad. The book includes a photo of the Rankin family, with Arthur Tappan Rankin standing at the right rear.20Ann Hagedorn, Beyond the River: The Untold Story of the Heroes of the Underground Railroad, Simon and Schuster, New York, 2002. Today the Rankin House is a National Historic Landmark and Underground Railroad Station, located on Liberty Hill which overlooks the Ohio River and Ripley, Ohio. One of the thirteen Rankin children was Arthur Tappan Rankin, who held a Doctor of Divinity degree, and served some 25 years as a Presbyterian minister in Greensburg, Indiana, before coming to Brigham City. Although he was 59 years old when he arrived, Rev. Rankin carried on an active ministry within the church and the community. During his service the local women’s society joined the Ladies Aid Society, which was formed statewide in 1895 in Ogden.21Yates, “History of first 125 . . .,” 6. Another note adds that he and a few of the men members held a prayer meeting and spent the night on top of Black Peak, the highest point of the adjacent mountain range, through which a Mr. Norris was converted. Although soldiers on opposite sides, they would fight the good fight together. At that time, Rev. Rankin must have been nearly 70 years old.22Ellen Baker, “History of Brigham City Community Presbyterian Church” unpublished manuscript, 1944, in the possession of Howard Anderson in 1977. It was during Rev. Rankin’s 11-year ministry, from 1896 to 1907, that the name of the church was changed from Box Elder to the Brigham Mission. Local newspaper reports indicate that Rev. Rankin was well-liked in the community, and served as a member of the city’s military band formed of veterans who performed for civic occasions. Coupled with his own ill health, he lost his wife of many years in 1904, but remained with the church through May 1907, before returning to live his last few years in Indiana.23Yates, 6 – notes from Brigham Bugler, 1890-95 issues; Box Elder News, 1904. Presbyterians were not the only denomination to see the possibility of converts and service in Brigham City. By 1885, the Methodist Episcopal Church of Utah had established the Scandinavian Methodist Church of Brigham City. Services were presented both in English and in Danish, whenever a Danish speaker could be obtained.24Sarah Yates, “Early Brigham had non-Mormons, too” Box Elder Journal, July 8, 1976, 7. This was part of a larger Methodist movement in Utah, which began in the summer of 1883 with the arrival of Martinus Nelson, the son of a Methodist minister in Norway. Of the many Scandinavian converts to Mormonism, it was estimated that about one-third left the church after they arrived in Utah.25The First Century of the Methodist Church in Utah, Utah Methodism Centennial Committee, United Methodist Church, Utah, 1969, 74, citing a review of William Mulder’s Homeward to Zion, “American Sociological Review,” April 1958. These were a target population, as were Scandinavians who had accompanied emigrant families but were not LDS converts. By 1891 there were 14 churches and chapels and 13 schools throughout Utah territory, including Hyrum, Logan, and Brigham City in Northern Utah.26Ibid., 74. This little church was close to the LDS First Ward, which elicited an interesting story from a former neighbor. Young Matthew Compton’s mother would send him off walking to the First Ward. One day, a teacher asked Matthew’s mother why he had not been attending Sunday School, only to find out that the youngster had been stopping off as he reached the closer Methodist Church and attending their Sunday School, which he said (in 1978) he thoroughly enjoyed. However, his family was not pleased.28Sarah Yates, interview with Matthew Compton, 1978. There was a rapid decline in attendance during the next few years. Rev. Mekkelsen (who also served the Methodist Church in Corinne) registered only one regular member in 1909. In 1918 the buildings were sold, since only occasional meetings had been held for the previous ten years. The church was converted to a home by a local family, with the cornerstone still bearing the building date and the two lots still sharing the common driveway that served the church and manse. This coincided with a decrease in Methodist work among Scandinavians in Utah, primarily due to the passage of time. Second generations of Scandinavians in Utah spoke English, and for the older people and the trickle of new converts from Scandinavian countries, Mormon leaders had removed the restriction on the use of Scandinavian languages in church meetings. Another factor in the Brigham City church’s decline was the proximity of a Methodist Church in Corinne, and the greater ease of transportation due to automobiles. Josephites, a break-off of the Mormon Church, also preached in front of the courthouse and downtown on occasion, but they were definitely not welcome in the community.30Box Elder News “The Josephites,” August 22, 1907. http://udn.lib.utah.edu/cdm/compoundobject/collection/boxelder/id/17756/show/17767/rec/1 See also Yates, “Early Brigham . . .,” 7. Rev. Gillespie’s little Presbyterian mission is the only Protestant church which maintained a continuous ministry in the heart of the community from 1877 to the present. It would not be until an influx of non-Mormons came to Brigham City for employment in the mid-20th Century that other denominations would establish churches. Now (2012) officially known as Community Presbyterian Church, this congregation literally became an inclusive community church, attracting members from a variety of denominations through the years. Its history throughout the 20th Century and into the 21st Century will be outlined in chapters covering those periods.